One in four older Americans falls each year, according to the National Council on Aging. 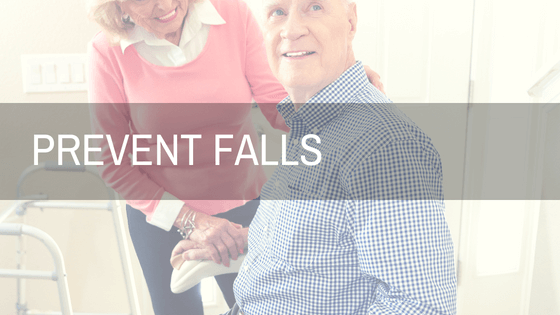 Fortunately, most falls can be prevented. Ask about your loved one’s latest eye checkup. If he wears glasses, make sure he has a current prescription. Notice if your loved one is holding onto walls, furniture or someone else when walking. These are signs that it might be time to see a physical therapist, who can help improve balance, strength, and gait through exercise. Talk about medications. Suggest that your loved one have all their medications reviewed with each new prescription. Also, beware of non-prescription medications that contain sleep aids, including painkillers with “PM” in their names. These can lead to balance issues and dizziness. Do a home safety assessment. Increase lighting throughout the house, especially at the top and bottom of stairs. Ensure that lighting is readily available when getting up in the middle of the night. Make sure there are two secure rails on all stairs. Install grab bars in the tub/shower and near the toilet. Remove or secure area rugs that could cause tripping.